The White House argued the move does not violate the First Amendment. A federal judge is expected to announce Friday morning whether he will grant CNN's request that he order the Trump White House to immediately restore a press pass to the network's chief White House correspondent, Jim Acosta. The court hearing and announcement, originally scheduled for 3 p.m. Thursday, was delayed until Friday at 10 a.m. without explanation. During an emergency court hearing Wednesday, the Trump administration defended revoking Acosta' press pass, arguing that the president has the power to exclude any and all journalists from White House grounds. “If the president wants to exclude all reporters from White House grounds he clearly has the authority to do that,” James Burnham, deputy assistant attorney general, argued before the judge on behalf of the president. "We’re talking about the physical White House, I mean the one building in which the president’s authority over how people act, where they go, should be at his apex," Burnham said. The West Wing is a tight, small space, he argued, which is why journalists want to be there. CNN and Acosta filed suit against President Donald Trump and top aides on Tuesday for stripping Acosta, without warning, of his access to the White House, where he works daily. The indefinite revocation of Acosta’s press credentials, known as a “hard pass,” came on the heels of a heated exchange between Trump and Acosta on Nov. 7. 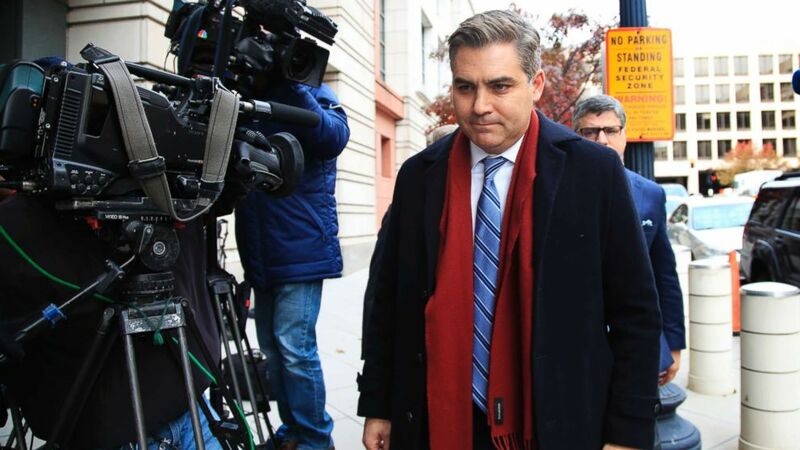 CNN and Acosta filed an emergency motion to have Acosta’s press pass immediately reinstated as the court case continues and asked for a ruling from Trump-appointed U.S. District Judge Timothy J. Kelly in federal court in Washington Wednesday afternoon. 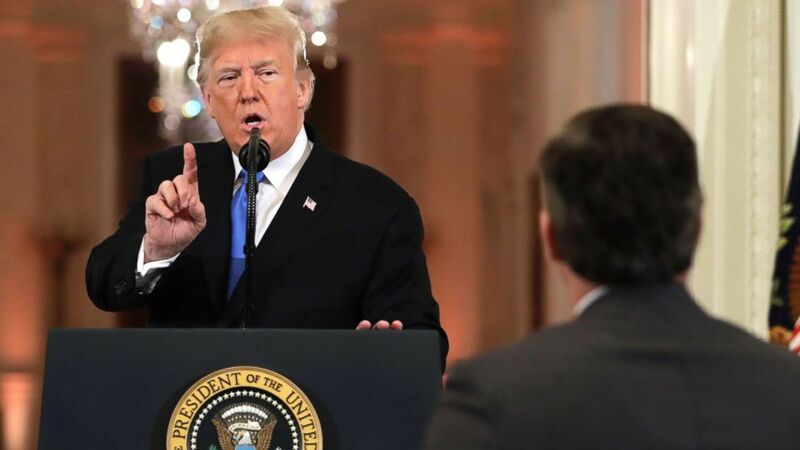 (Jonathan Ernst/Reuters) A White House staff member reaches for the microphone held by CNN's Jim Acosta as he questions President Donald Trump during a news conference following Tuesday's midterm elections at the White House in Washington, Nov. 7, 2018. On Wednesday, the judge pushed CNN’s lawyers on how they can prove that Acosta's press pass was revoked specifically because of the content of Acosta’s reporting rather than based on his behavior, which the president described as "rude." CNN's case relies heavily on Sherrill v. Knight, a 1971 case which established that taking away a journalist's press pass because of the content of their coverage is prohibited under the First Amendment. Boutrous said the issue was bigger than Acosta or CNN. “Rudeness really is a code word for ‘I don’t like you being an aggressive reporter,’” he said, which threatens the right of journalists to ask tenacious questions and, he argued, will have a "chilling effect" on the White House press corps. It's Trump who “establishes the tenor and tone of these press conferences,” Boutrous argued, and "wants it to be a free-for-all, that's his prerogative." "He is the most aggressive, dare I say rude, person in the room, and I’m not being critical -- this is the rough and tumble of the presidency, and that’s what the First Amendment protects,” Boutrous said. 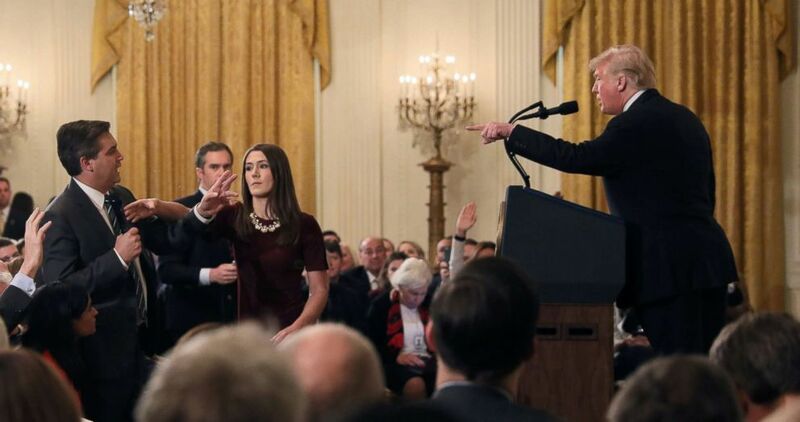 The defense argued that denying Acosta a press pass was not a violation of the First Amendment as there is no guaranteed access to the White House, and dozens of other CNN reporters with "hard passes" could continue to serve public interest by reporting on the White House grounds. Acosta could continue to do his job by watching video fed back from the White House, the defense argued. Boutrous called their argument a "fundamental misconception of journalism." "Different reporters break different stories. This notion that it's some minor thing to be in the White House, be at a gaggle ... to work your sources in the White House, to go talk to the government officials who are there, that is invaluable access. We have evidence, they have no evidence," Boutrous said, also arguing that the president can't decide who CNN sends to the White House or exercise control over who the network wants to be its chief White House correspondent. "There's no First Amendment doctrine that, if there are a bunch of other reporters, you can bar someone else and it's not a violation," Boutrous said, but Sherrill v. Knight, the lawyer argued, established the opposite. "There's an interest to ensure that no one reporter is excluded -- and it's the public's interest," Boutrous said. "Maybe that's the reporter who would break the story, who would break the story wide open because of their sources." The judge also asked whether the White House could act differently to reprimand Acosta without taking away his pass in full — something like not allowing Acosta in briefings with the president but letting him on White House grounds. Boutrous said that suggestion would still be a violation of First Amendment rights. (Manuel Balce Ceneta/AP) CNN's Jim Acosta walks into federal court in Washington D.C., Nov. 14, 2018, to attend a hearing on legal challenge against President Donald Trump's administration. Trump's administration contends it has "broad discretion" to regulate press access to the White House as it fends off a legal challenge from CNN and other outlets over the revocation of Acosta's "hard pass." “Mr. Acosta’s decision to engage in conduct that disrupts press events and impedes other reporters from asking questions provides a more-than-sufficient reason for revoking his hard pass,” the president’s attorneys wrote. The brief focused largely on Acosta’s “disrupt[tions]” during the press conference rather than a previous explanation by White House press secretary Sarah Sanders, which CNN promptly denied, that Acosta had placed his hands on an intern who tried to take away his microphone. The judge declined to characterize it as a "shift" in narrative. (Evan Vucci/AP) President Donald Trump speaks as CNN's Jim Acosta, standing at right, listens, during a news conference in the East Room of the White House, Nov. 7, 2018, in Washington. Many individual journalists who attended the press conference have shared personal accounts and spoken out, defending Acosta. Major news outlets also joined together to issue a statement in support of Acosta and CNN Tuesday, and filed "friend of the court" briefs in the case. “Whether the news of the day concerns national security, the economy, or the environment, reporters covering the White House must remain free to ask questions. It is imperative that independent journalists have access to the President and his activities, and that journalists are not barred for arbitrary reasons,” read a statement issued by The Associated Press, NBC News, FOX News, POLITICO, The New York Times, The Washington Post and more. “Our news organizations support the fundamental constitutional right to question this President, or any President. We will be filing friend-of-the-court briefs to support CNN’s and Jim Acosta’s lawsuit based on these principles,” the statement continued. The statement echoed one from the White House Correspondents' Association, which criticized the Trump White House decision and supported CNN. Vice President Mike Pence, who is on a tour of Asia, was asked about Acosta and press freedom after he criticized Myanmar's lack of freedom during the trip. "This administration has stood strong for a free and independent press and defended the freedom of the press on a world stage," Pence told reporters in Singapore. "There's no comparison whatsoever between disagreements over decorum at the White House and the imprisonment of the two reporters in Myanmar."